I made a dress! 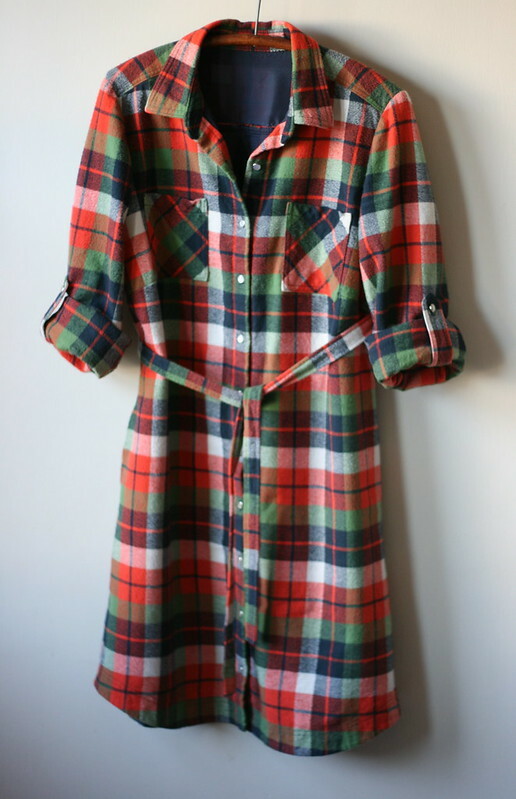 And not just any dress, but a cozy flannel dress. It’s time to post this cool-weather project before spring gets here, so let’s get down to it! 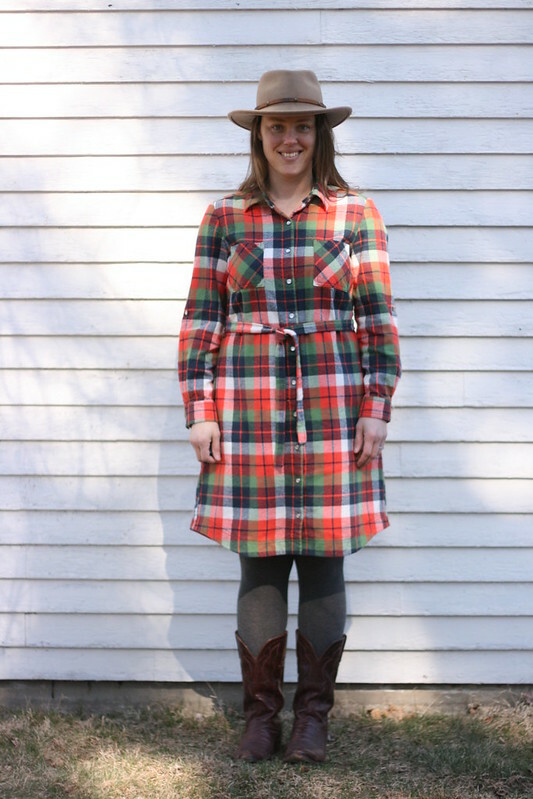 Today’s project is Simplicity 8014, a shirt dress made from lofty Robert Kaufman Mammoth Flannel in the Adventure colorway. 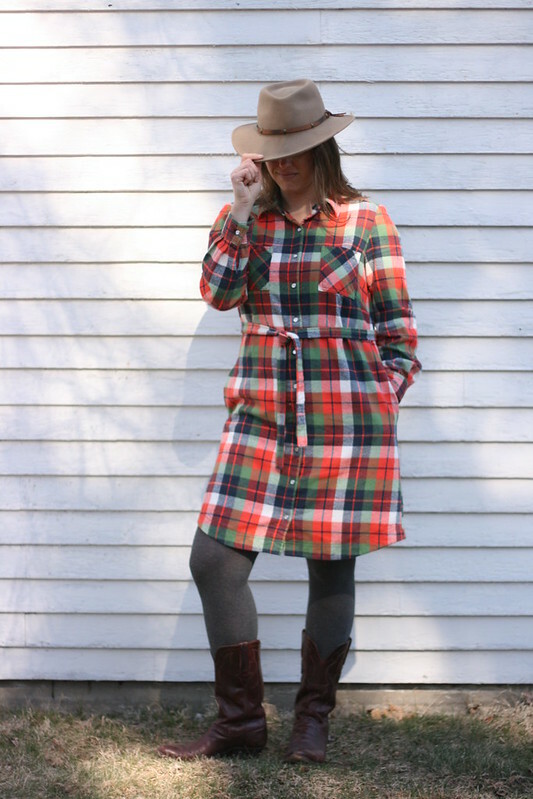 Not only is this dress soft with plenty of ease for comfort, it’s also underlined with a slippery rayon Bemberg lining fabric so it glides easily over tights or leggings. If you’re not familiar with underlining, it’s when you take two layers of fabric and hold them together as if they were one, sometimes from the start of the project, and sometimes beginning after the darts have been constructed in each layer. It is different than lining or interlining. (In fact, I think we should make up more sewing terms with the word ‘lining’ in them just to make it more confusing. 😉 ) Underlining can have multiple benefits. It strengthens the garment, especially if your fashion fabric is light or loosely woven, and it can provide a layer to stitch into (for hems, etc.) that won’t show your stitches on the outside. (Here’s a great article from Threads Magazine that explains everything better than I could.) In my case, I wanted a smooth layer that would keep my dress from catching on tights or leggings. I’ve only underlined garments maybe once, but in that case, I read about what underlining was and then applied the definition as I saw fit. This time, I decided to actually follow the traditional process for underlining. There are four views in this pattern. 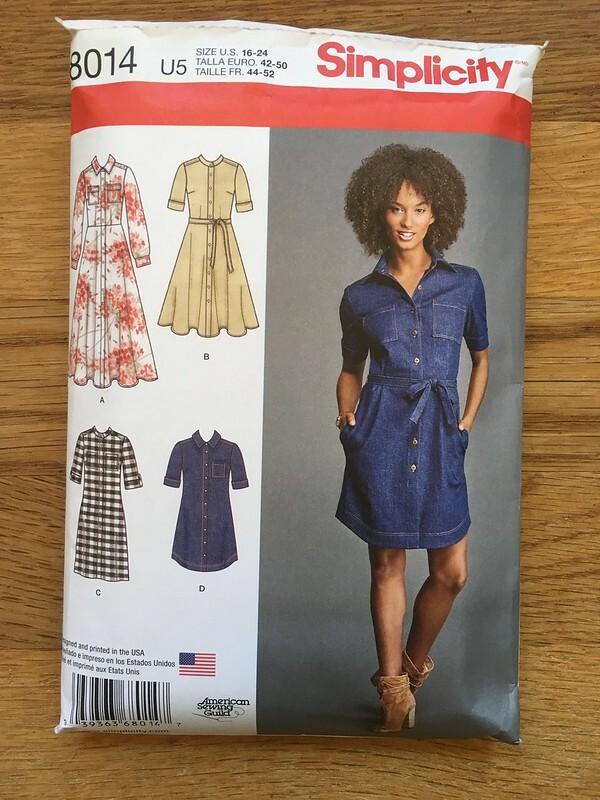 I made View D, but dropped the hem of the dress to the length of View C. I also chose to make this with long sleeves and interior tabs in case I want to roll the sleeves up at some point. I made a 16 in the bust and graded out to an 18 for the waist and hips. I also lowered the bust dart and did a major broad back adjustment. Fabric for this project came from Pintuck & Purl, and buttons, thread, lining, and interfacing came from Jo-Ann Fabrics. Despite the look of the buttons, they aren’t pearl snaps. Buttons seemed more secure for a dress, and these are some of my favorites. 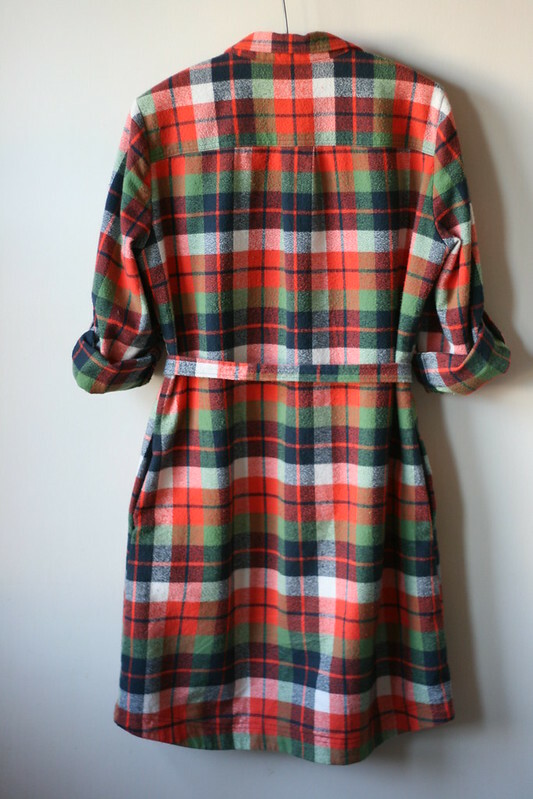 In order to underline this dress, I cut out all of my pieces in the flannel, and then also cut out the body and hem facings a second time in Bemberg/Ambiance rayon. I didn’t think a smooth inside was necessary for the sleeves. I chose Bemberg as my underlining fabric because it is a semi-synthetic/semi-natural fabric (rayon is made from wood pulp) and because it’s not prone to static cling. 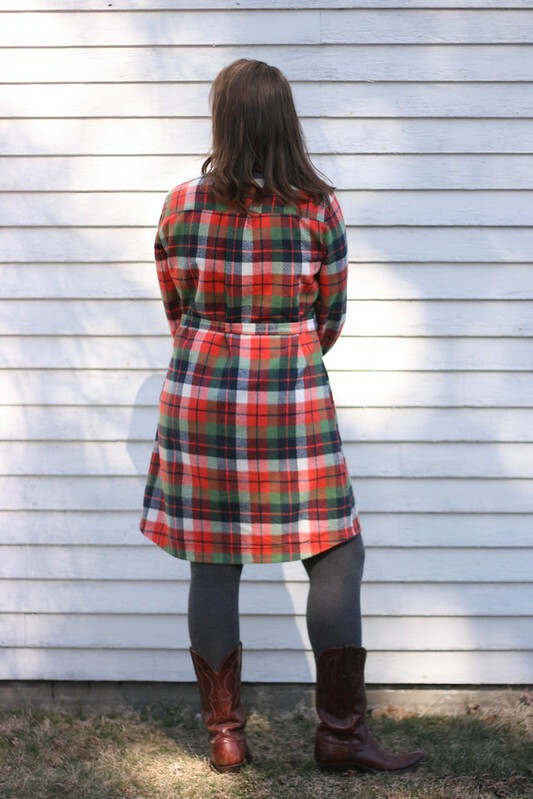 Using the method outlined in the Reader’s Digest Sewing Complete Guide to Sewing, I basted the layers of flannel and rayon together and then trimmed the rayon to more closely resemble the flannel. Cutting out the rayon was a bit tricky, but a lot of those imperfections got trimmed off or were hidden in the seam allowances. It would have been easier and more accurate if I had used a rotary cutter, but my cutting mat wasn’t large enough for me to do that without having to move my pieces around. Once it was all basted, I sewed it together using the pattern instructions. Since I try to focus on learning only one or two new techniques per project (most of the time), I decided not to worry about perfect internal finishings, and I zigzagged and trimmed my seam allowances. Because I bought the last of this fabric (although it has been restocked since I made this dress), I didn’t have enough extra fabric to put my yoke or cuffs on the bias. I did manage to cut my chest pockets on the bias, but here’s where we enter ‘things I should have done’… Next time it wouldn’t be a bad idea to interface those pockets if they are on the bias because I think mine started stretching a little as I handled and sewed them. I also think it would have been a good idea to put just a little bit of interfacing under the buttons for the sleeve tabs to strengthen that area a little bit. So, final verdict? This is a great dress! As a friend of mine pointed out, it sort of fits into one of my favorite clothing categories: secret pajamas. It’s warm and cozy and kind of like a nightgown with a belt. I love that it has pockets and is loose and comfy, but has the belt for a little bit of shaping. Ironically, I finished this the day before we got some warm weather. I tried to wear it to a Sip & Stitch craft night at Pintuck & Purl, and completely overheated and had to change within about 10 minutes. Haha! Oh, well. It’s been cold since, and I’ve really enjoyed wearing it. Added bonus: this was one of my 2017 Make Nine Projects, so that’s one more down! 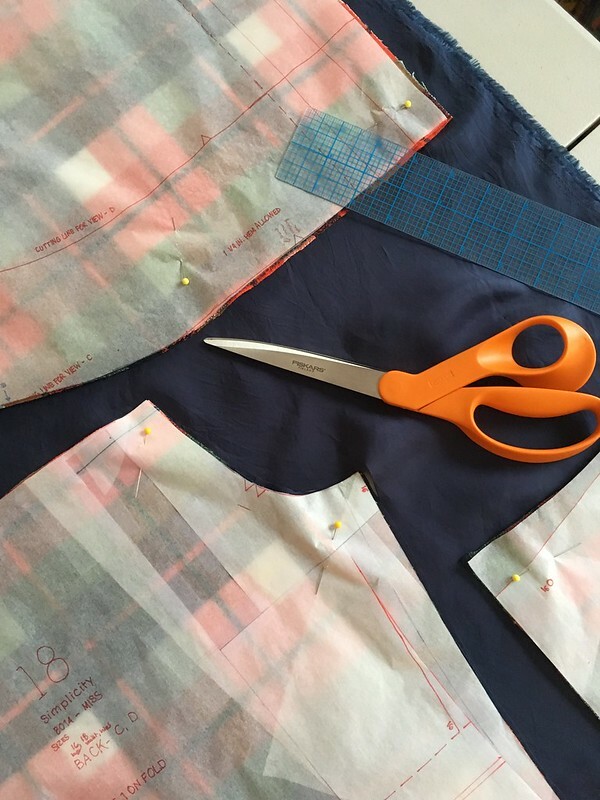 In case you are curious about lining fabrics and other resources related to that, check out this article from the blog A Fashionable Stitch: Understanding Lining Fabric + Resources . 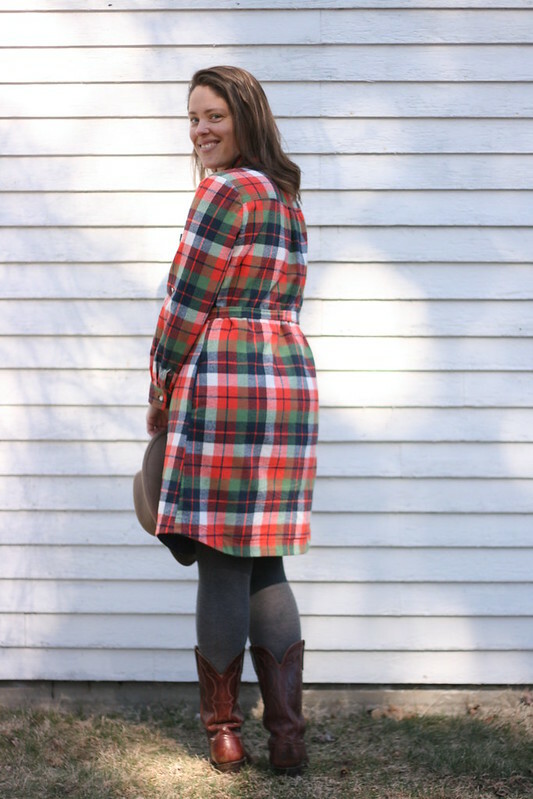 This is such a great blog if you want to increase your sewing knowledge and skills. 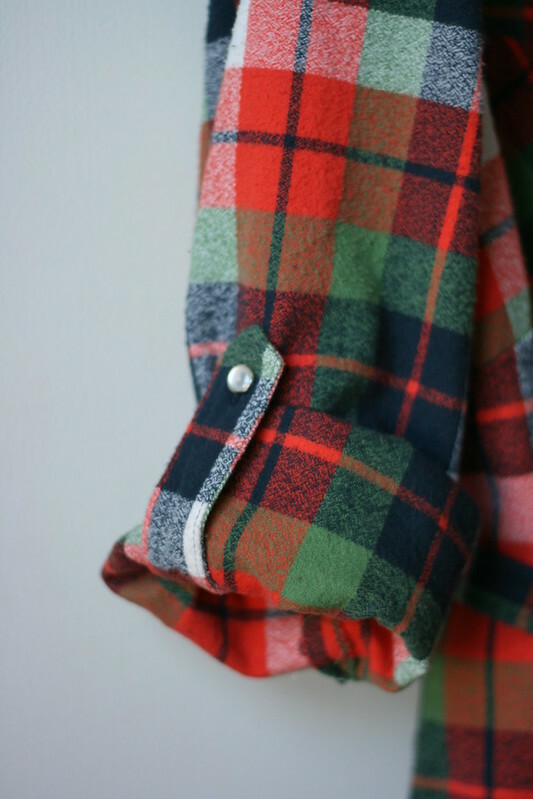 There are a number of posts on different types of fabric and so much more. 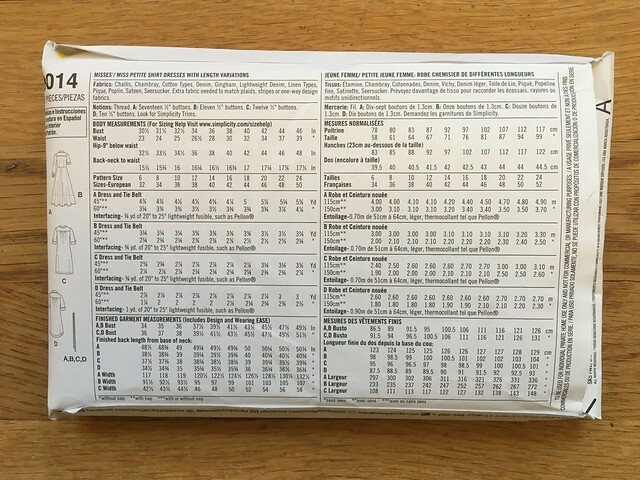 In fact, here is a post from the same blog on rayon wovens. If you are new to sewing or just want to know what the big deal with rayon is, this post will clue you in. It’s a relatively new fabric for me, but so far I really like it. I know we already talked about my personal 2017 Make Nine challenge, but if you want to read more about it or are interested in jumping in yourself, here’s a recent post from the challenge’s creator, Rochelle New, on what it is and how you can join in. So far, I’ve found it really fun.